In this post, we have summarized for you the current drone laws in Argentina. Basically, flying drones for private purposes is allowed. On the other hand, it becomes more complicated if you want to use a drone for commercial purposes in the country. Maximum altitude: In Argentina, your drone may ascend to a height of 120 meters (400 feet). Below controlled airspace, multicopters are only allowed to fly 43 meters (140 feet). Maximum horizontal distance and FPV: In Argentina, you are only allowed to operate your drone within the direct line of sight. Compulsory insurance: Compulsory insurance exists in Argentina only for professional users. In my opinion, you should still insure your drone so that all your travel destinations are covered. Maximum take-off weight (MTOW): For private flights without registration, the upper limit is 10 kilograms. Distance to airports: To airports, you have to keep a distance of 5 kilometers. In addition, your flying drone can not approach closer than 1 kilometer of helicopters and 500 meters of heliports. Other safety distances: Your copter may approach a non-involved person no more than 30 meters horizontally and 10 meters vertically. Flights over populated areas or crowds are prohibited. You must be at least one kilometer away from settlements during your drone operations. No-fly zones: In national parks the operation of drones is prohibited. Flight Permits: No information found yet. Operating times: Operation of drones is only permitted in daylight in Argentina. Registration of the Multicopter in the National Aircraft Register: The costs depend on the size of the drone and start at 800 pesos for unmanned aerial vehicles up to 10 kilograms. Permission to operate the drone: 2,700 pesos. Permission to operate a drone in Argentina: 1,100 pesos. Registration takes place via this platform. Please allow a processing time of at least 5 working days. During the flight, your drone must be provided with a badge bearing your name and address. 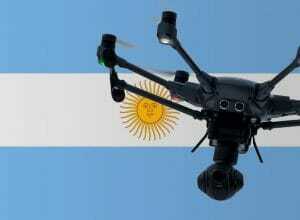 Good to know: In Argentina, a minimum age of 16 years for the operation of drones. Copter pilots under the age of 18 must be supervised by an adult guardian during drone flights. We have researched the listed drone regulations for Argentina to the best of our knowledge. We cannot guarantee the correctness of the information. If you want to be on the safe side, contact the competent aviation authority. Alternatively, you can also ask the embassy in your country for further information about the regulations. Please leave us a comment when you receive news and/or gain experience with your copter in Argentina! Do these laws apply to tourists of just citizens? It seems like you can’t apply on the website without an address in Argentina. You might registrate on the website https://cad.anac.gov.ar/SIAC/Account/Register using your proper country in the “pais” pulldown menue. ARTICLE 5.- Any individual that intends to operate a remotely piloted aerial vehicle or a system of remotely piloted aerial vehicles must have an authorization issued by the ANAC, with the exception of small vehicles for sport or recreational purposes and under the conditions that are established in accordance with the provisions of Chapter III. I do not think that a discussion about “recreational” translated by Google(!) is helpful. I have visited Argentina (Patagonia and Andes) during 4 weeks. In all national parcs drones were excplicitely forbidden (as in Buenos Aires). Additionally, in Patagonia the wind was so terrible that all drones will have problems catching good stable records. In fact, you have to wait for a good day – and this will take take time (which you normally do not have). My recommodation: leave your drone at home unless you want to use it professionally. the original post was regarding general drone laws in all of argentina. Like anywhere else, the laws will vary in certain areas such as national parks, but in barring additional restrictions drones can be flown anywhere in the country for recreational purposes.